In the Mediterranean today, one finds the spice markets, for the most part, in the Muslim countries, the Latin and Greek Mediterranean having given up cooking spices long ago. Today, one can still smell the allspice, cardamon, cloves, and various bahārāt mixtures in their burlap bags and satchels while strolling through the Sūq al-Baḥramiyya and Sūq al-Sakatiyya in Aleppo. 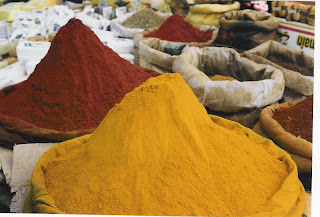 In Alexandria, another important Levantine spice market, one could buy all kinds of spices, and in Morocco the cuisine is an ode to spices even today. An example is the fish marinade or relish known as sharmūla. Moroccan cooks, to cook thicker cuts of fish, use a kind of relish-marinade of finely sliced or torn herbs and spices called chermoulla, tchermila, chermoula, or charmoula, which are various transliterations for sharmūla , ﺷﺮﻣﻮﻟﮥ , derived from the word meaning “to tear lightly.” Some cooks gently heat the sharmūla in a pan or liquefy everything in a blender. The marinade is also used with chicken. The suggested amounts in parentheses are in case you decide to put everything in a food processor. Mix all the ingredients together and refrigerate for 1 hour before using. 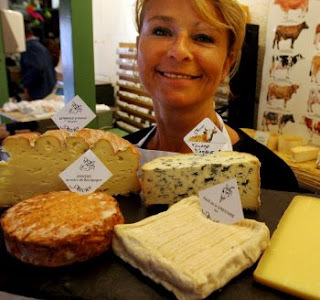 Roquefort is world famous, but there are other delightful cheeses from the Languedoc, though few are imported into this country. I enjoyed the tiny goat cheese called Pélardon, once recommended for jaundice, and Cabécou, a small round goat’s milk cheese with its hint of grass and milk, but also Pavé de la Ginestarié, a fermier cheese (farm made) from the Tarn, a region of Languedoc in the hills, where Albi is the capital. It is a creamy yellow-white goat cheese that was pleasant with a slight taste of straw, and not as distinctive as the Anneau de Vic-Bilh Tarn, a fuzzy, strong-tasting goat cheese from the Pyrenees with a rind of natural mold powdered with charcoal that sticks to the top of your mouth. Pas de l’Escalette is a cow’s milk cheese from the Rouergue, a region of the Aveyron, part of the Massif Central, where Roquefort comes from. It is a crusty-skinned, mild, and familiar-tasting type of cheese. Pérail, from Larzac in the Rouergue, is a ewe’s milk cheese with a smooth texture like very thick cream and a velvety flavor. Laguiole-Aubrac is a straw-colored, cylindrical, pressed cow’s milk cheese with a grayish rind and strongish flavor, also called fourme de Laguiole, made in the small village of the Rouergue. Its strong and rich flavor is said to come from the milk, from the Aubrac cows, and the kind of vegetation eaten by the cows, and its production has been regulated since the twelfth century. A very old preparation, soupe au laguiole, is an oven-roasted soup layered with this cheese, cabbage, bread, and chicken broth. Another cheese is Picodon de Saint-Agrève, a small and soft goat’s milk cheese from the Vivarais in Languedoc. The name comes from the Occitan word for “spicy,” although the taste is very dry rather than spicy. For finding these cheeses try www.igourmet.com or artisanalcheese.com. When asked about food in the Mediterranean I sometimes start off with a mention of Tunisia because so few people know anything about this Arab country on the southern shores of the Mediterranean and its spicy food. Fewer still have been to Tunisia or eaten its food. That's a shame because it has a cuisine that is historical, has great depth, is exciting and enticing, and perhaps most importantly very do-able in an American kitchen. A simple place to start is fennel salad to which I sometimes add a can of good quality imported tuna in olive oil. this is a nice time of the year to try it. that they weren't Italian restaurants but Italian-American restaurants and that there was a difference. But there was one dish that was the same whether you had it in Long Island or Naples and that was linguine con vongole, linguine with clams. The menu offered "white" or "red," meaning with or without tomato sauce. I preferred white. Linguine con vongole to this day remains one of my favorite pasta dishes. When I make it I never can decide whether I want to leave whole clams in their shells on top or remove them. Both ways are great. To make this spectacular dish visit the recipe here. For a story about the best linguine con vongole ever read this. Libyans will tell you that their region was always too poor to have developed a cuisine. Like much of the cooking in Egypt, everything appears vaguely familiar, from other regions. The Italian influence is strong, especially in restaurants, and Libyans eat lots of pasta. Whether this was the result of the Italian occupation or an addition to a pre-existing substratum of macaroni cookery, as I believe to be the case in neighboring Tunisia, is uncertain. Contemporary Libya can be divided into the historical regions of Tripolitania to the west and Cyrenaica to the east. Sirte, in the middle, could be considered the "couscous line" of North Africa. That means, to the west of this line couscous is a staple food and the people eat couscous from here all the way to the shores of the Atlantic, while to the east of the line, to the Suez, couscous is occasionally eaten, but is not a staple food. Libyans living to the east of the line eat mostly Egyptian-style food, although their olive oil consumption today is the highest in the world, at seventy grams a day, about twice that of the Italians. If any dish can be considered a "national" dish, it is either bazīn or shūrbat Libiyya. Bazīn is an old preparation, a kind of polenta made with semolina and water and sometimes yeast, found along the southern Tunisian and Libyan littoral. It is related to the simple meal of barley flour, olive oil, and water called basīssa, known since medieval times by people in North Africa. This was a preparation that the fourteenth-century philosopher Ibn Khaldūn called the "first food" of Ifriqiya (Tunisia) in his Prologomena. The dish can also be made with fish. Bazīn is often made for the Id al-Kabir, the holiday feast celebrating the sacrifice of Abraham, in the Sfax and Sousse region of Tunisia. This recipe was given to me by Professor Lisa Anderson, a scholar of modern Libya at Columbia University, who tells me that it "summarizes Libyan cuisine, such as it is." 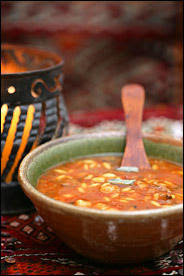 Shūrba means "soup," and this is Libyan-style soup. It will appear in my forthcoming book THE BEST SOUPS IN THE WORLD. 1. In a medium-size casserole, heat the olive oil with the samna over medium-high heat, then cook the onion, stirring, until translucent, about 5 minutes. Add the beef and cook on all sides until brown, 2 to 4 minutes. 2. Add the tomatoes, the tomato paste dissolved in 1 cup of the water, the chickpeas, parsley, cayenne pepper, cinnamon, bzar, and salt and cook for 10 minutes. Add the remaining 4 cups water and cook, covered, until the meat is tender, 1 to 1 1/4 hours. Add the pasta and cook, uncovered, until done, about 10 minutes. Just before serving stir in the mint. The Libyan spice mix known as bzar is usually made of equal parts of black pepper, cinnamon, cloves, nutmeg, turmeric (or zedoary (Curcurma zedoria) or galangale), ground ginger, and a smaller part cumin. Mix together a 1/4 teaspoon each of black pepper, cinnamon, cloves, and cumin to make the bzar for this recipe. If making a larger quantity, use all the spices mentioned. One of the delights of summer cooking is that one naturally, it seems, keeps things simple. Why not? We don't work as hard or shouldn't, yet we like a flavorful and memorable dish that won't tax the cook. We sometimes can get Santa Barbara prawns, also called spot prawns, fresh with their heads on. The local fish stores sells it at the ridiculous price of $26 a pound which I don't buy. But sometimes the guy from Santa Barbara comes down with a truck full of prawns to sell at one of the local farmers markets and we can get them for $4 a pound. This is when I make spaghetti with shrimp and scallops. It's quite easy and will take you about 45 minutes to get on the table. When we lived in Massachusetts August and September were the months for grilled swordfish. I would have to say that along with bluefish it was our favorite fish. Today, we can't get bluefish at all on the west coast and swordfish is prohibitively expensive, so nostalgia is the inspiration here. Swordfish are big pelagic billfish found widely distributed throughout temperate, subtropical, and tropical waters of the worlds oceans and seas. Swordfish are found in coastal as well as in oceanic areas and are the only member of the family Xiphidae. We always cooked swordfish in the Sicilian style which I find to be the best way, and that usually meant grilled. 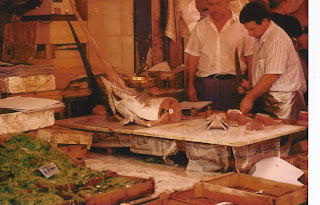 We liked our swordfish cut one inch thick, but Sicilians prefer it thinner, maybe a half inch thick. The thinner slices is what you'll need to make this once common recipe in our household, involtini di pesce spada. It's really a don't miss.